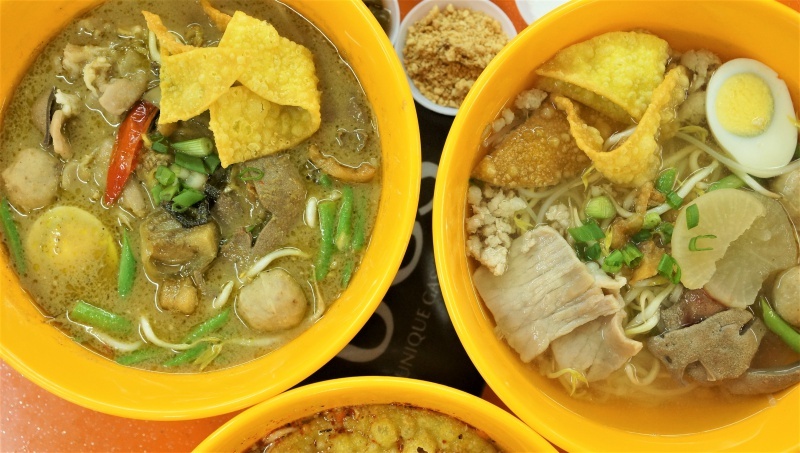 Bangkok is named one of the best cities in the world for street food. You may have missed one of the best part of Thailand if you have never grabbed a snack from the roadside push cart, wolfed down some of the best desserts from the night market or sat on a plastic or wooden stool along the street of Bangkok enjoying the various local food. It is simply amazing to find how delicious Thai food it is. 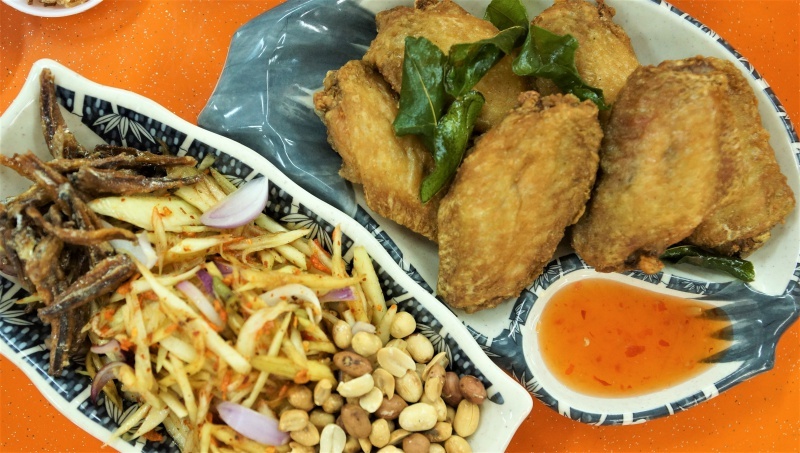 Singaporeans’ love for Thai food provides good incentives for the Thai eateries sprouting in this part of the island. 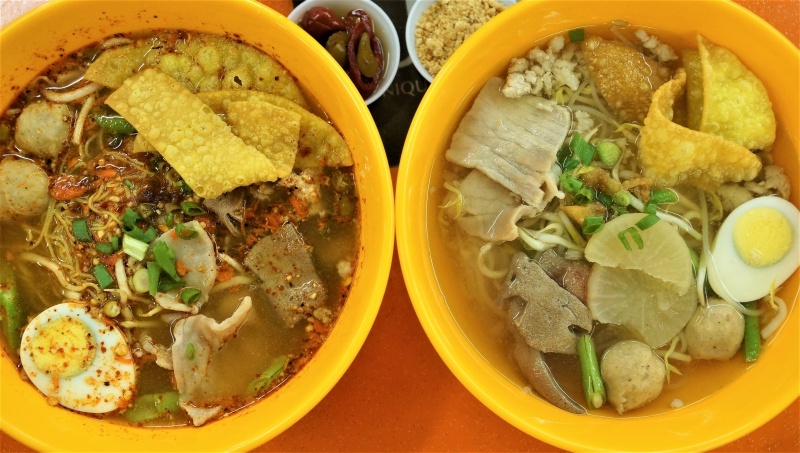 There are some real good and authentic Thai foods around and one of the latest additions is a humble Thai style noodle stall in a Coffeeshop along Paya Lebar road. 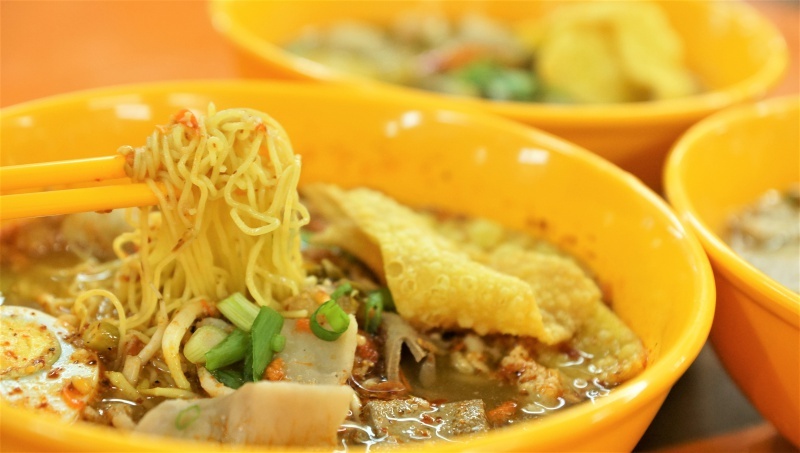 “Thailand Street Food” specialises in Northern Thai style noodle, you can choose Thai rice noodle, Mee Kia, Glass noodle, Mee Hoon, Mee Suan and Kway Teow, the assortment of noodles can be paired with the choice of traditional TomYam or green curry for those who loves hot and spicy, or opt for the non-spicy clear soup base. 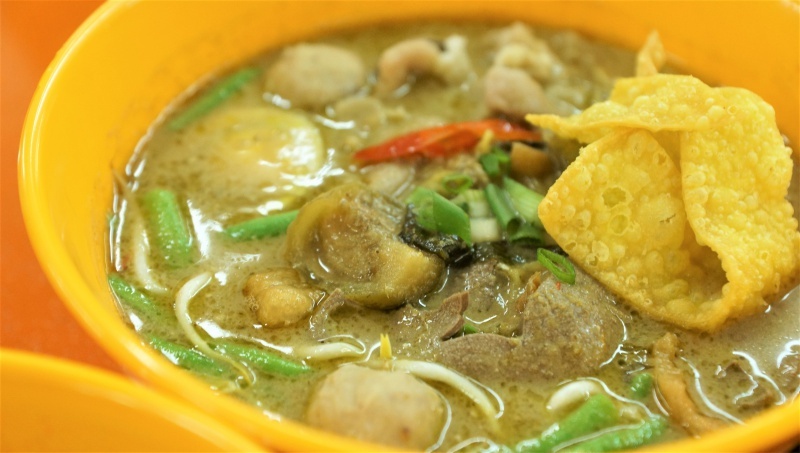 Thai Street Food is manned by a Thai chef to provide you the most authentic Thai street style noodles to the diners. Not made from the off-the-shelf Tom Yum paste, Thai Street Food uses the home made Tom Yum ingredients for a bowl of succulent noodle, the soup was a clear version of Tom Yum which is the authentic Thai flavour, the soup was inundated with piquant flavour, releasing a rounded sweet, sour and spicy flavour that is not easily forgotten. 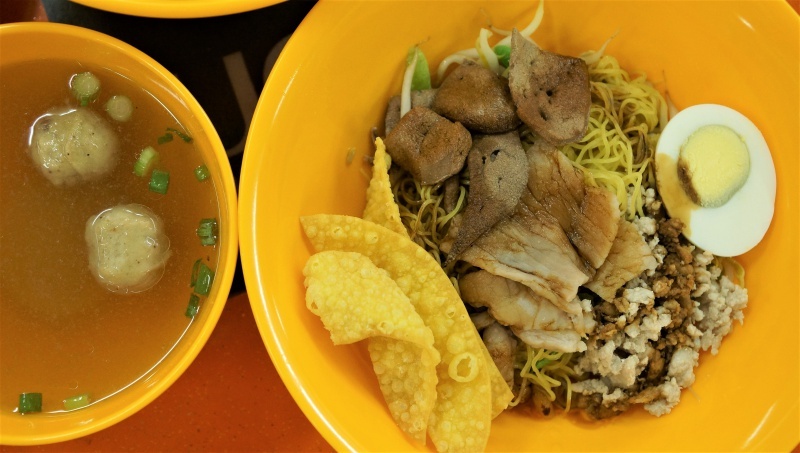 Premium mee kia was used rather than ordinary mee kia ensure the best texture after cooking, complemented by the toppings like pork slices, meatballs, pork liver, pork minced meat, hard-boiled egg and fried wanton skin, the iconic soup was a pleasant to the taste buds. A highly recommended dish should not be missed. The Thai spices and herbs went perfectly well to create a lip-smacking, aromatic green curry, we love a green curry that have a perfect balance, adorned with luscious homemade green curry taste. The quintessential Thai aroma was infused with fiery chili with a sweet smelling concoction but not at all cloying. It gave the taste buds tingling which we loved. 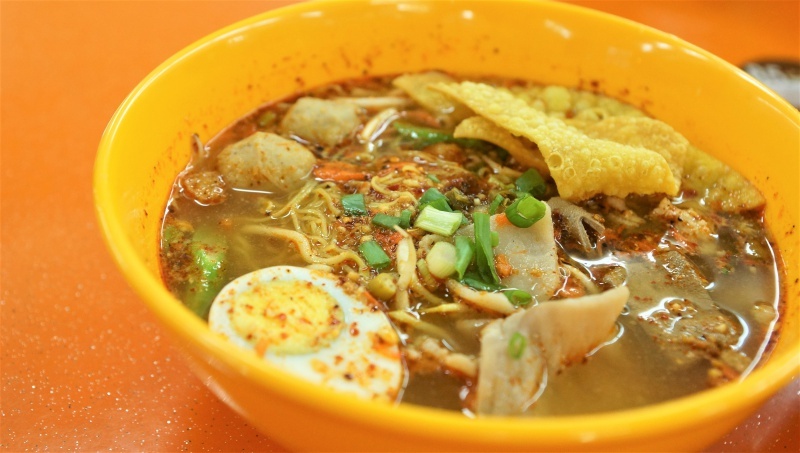 If you are not the fan of the fervently hot Tom Yum and green curry noodles, the non-spicy broth is a good alternative choice, consisting of pork slice, meatballs, pork liver, pork minced meat, hard-boiled egg and fried wanton skin, the well brewed broth was a medley of sweet and savoury flavours, rice noodle was silky smooth and chewy, perfect texture infused with taste of Thai. Broth may appear thin and unsophisticated but taste was speculative. 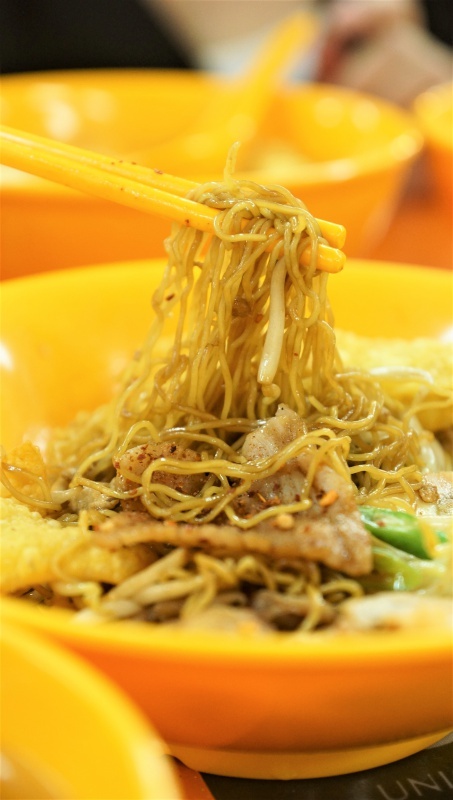 Dry version is available if you are not a fan of soupy noodles. 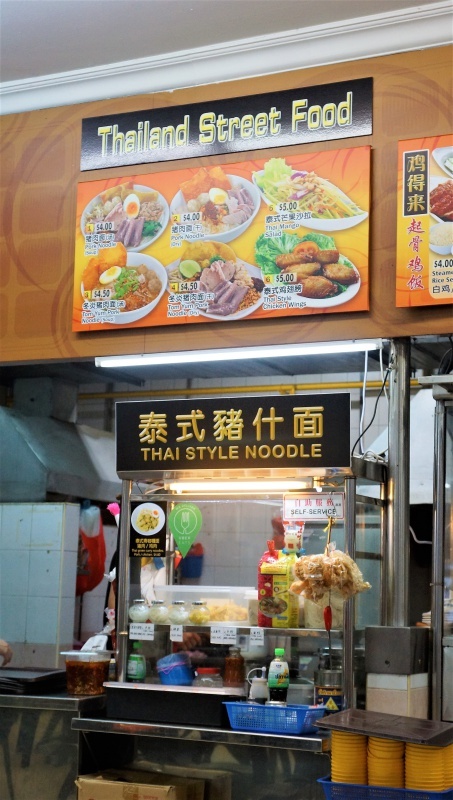 Thai style noodles may appear “pale” which could be deceiving from a bowl of insipid noodle. 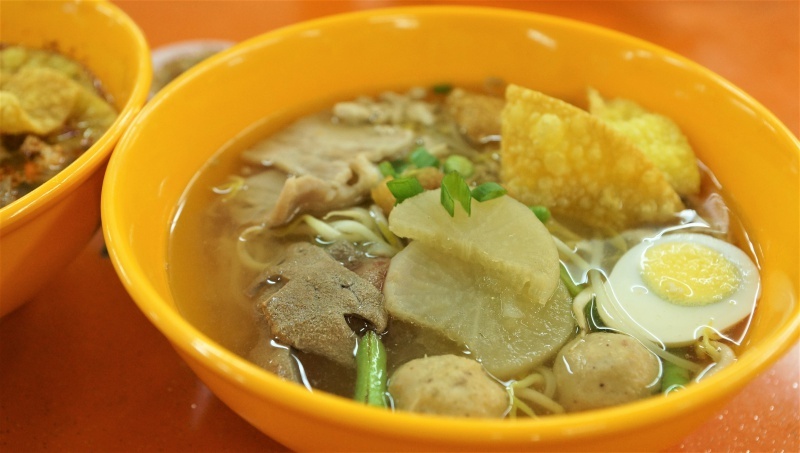 Consists of pork slice, meatballs, pork liver, pork minced meat, hard-boiled egg and fried wanton skin. The flavors here are cleaner and lighter but no less delicious. 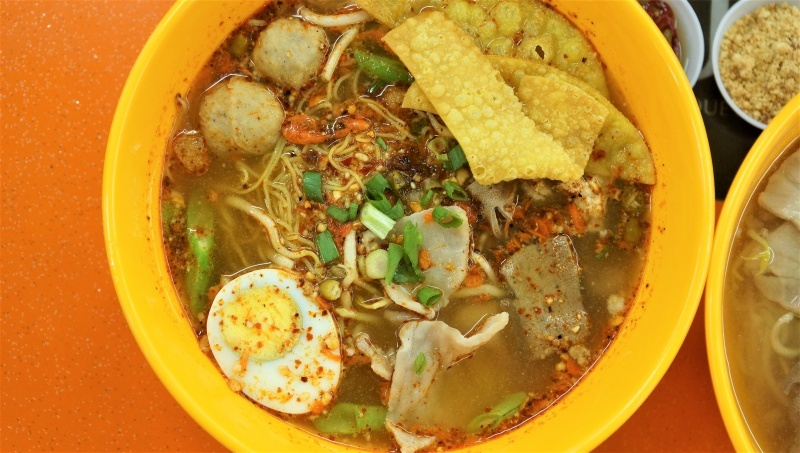 Do enjoy the authentic Thai style noodle the Thai way – marinate the noodle with the addition of Thai spices and condiments eg. chili flake, grated peanut, sugar etc that are available and perfectly enriches the gourmet experience with the myriad of flavours. Deep-fried chicken wing was crispy; meat was juicy and tender though flavour could do a bit more depth for a more intense flavour. 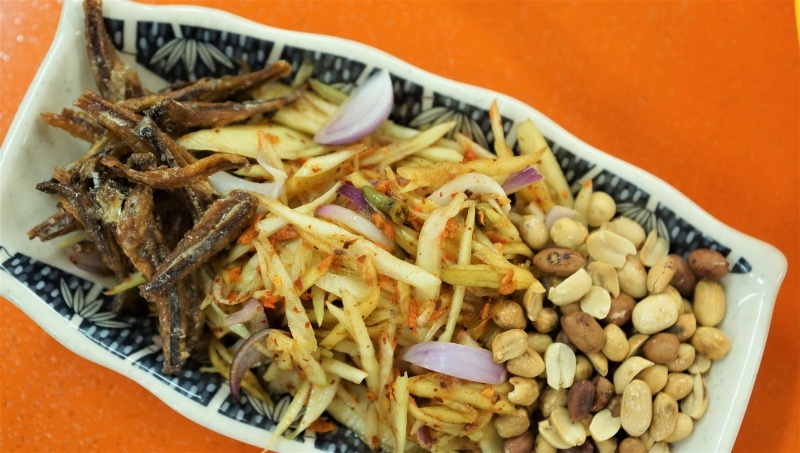 Shredded Thai green mango marinated with vinegar and fresh chili, served alongside with the roasted peanuts and deep fried Ikan Bilis, It was all at once mildly spiced, sweet, sour and savoury The exotic flavours made it a coveted Thai salad that was hearty and comforting. 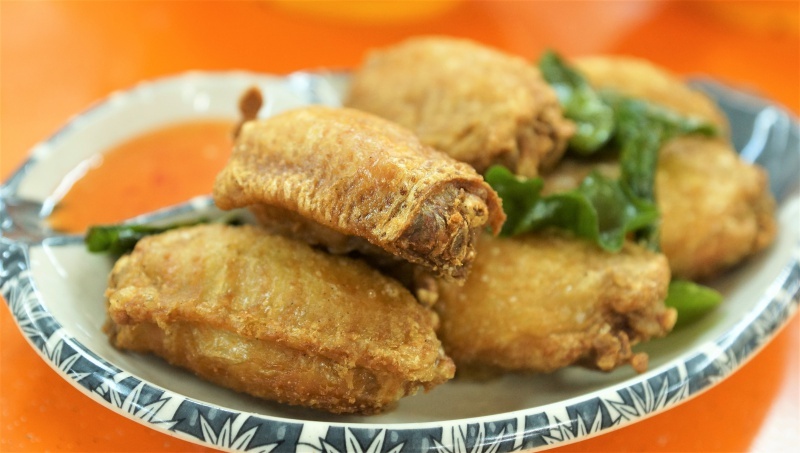 The important thing of Thailand Street Food is that all the dishes work, undeniably simple and unpretentious. 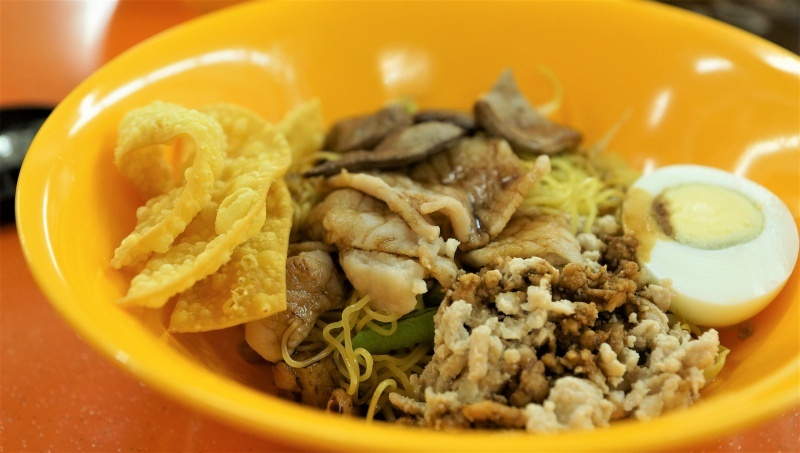 The chef’s culinary skills to created a nice flavour that accentuated the ubiquitous tastes in each bowl of noodle. Is it worth for a revisit? You bet.